You'll love this book, the recipes are easy, the ingredients are easy to get and they don't take long to make. 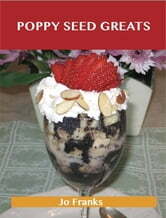 Foodlovers turn to Poppy Seed Greats for information and inspiration. Everything is in here, from the proverbial soup to nuts: Almond and Rice Flour Bread with Poppy Seeds, Appetizers - Ham Biscuits, Spritz Cookies (Need Cookie Press) and Four Variations, iSummer Fruit And Mixed Greens, Super Salad Seasoning Mix, Superstar Spinach Salad, Ukrainian Crescents ...and much much more! This is a very satisfying book, however I would recommend you eat something before you read this book, or you won't be able to make it through without reaching for a skillet or saucepan! Poppy Seed Greats is packed with more information than you could imagine. 71 delicious dishes covering everything, each employing ingredients that should be simple to find and include Poppy Seed. This cookbook offers great value and would make a fabulous gift. This book will also give you enough inspiration to experiment with different ingredients since you'll find the extensive index to be extremely helpful. The recipes are superb. Wonderfully easy to put together and you don't have to make or purchase a ton of condiments before you have a chance to play with them. Vegan Cookbooks: 70 Of The Best Ever Scrumptious Vegan Dinner Recipes Revealed!